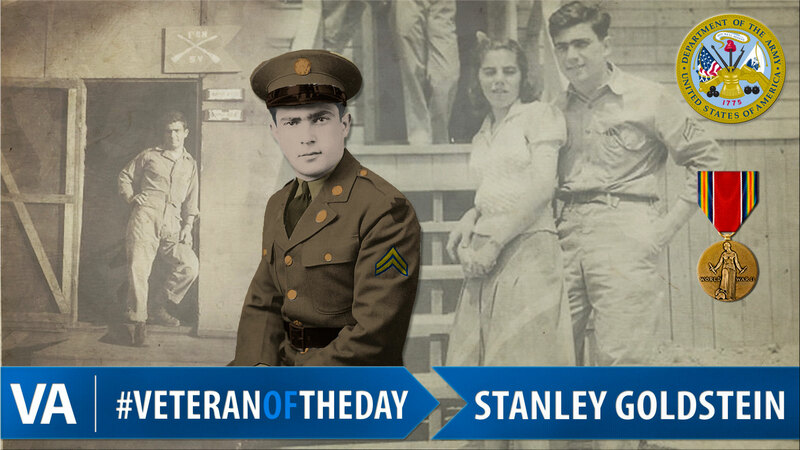 Today’s #VeteranOfTheDay is Army Veteran Stanley Goldstein. Stanley served during World War II. In 1940, Stanley joined the Pennsylvania National Guard after seeing advertisements in the paper for a one-year term of service. He ended up serving for five years when the war began as part of the regular Army and was assigned to 111th Infantry Service Company. His unit was responsible for driving trucks and delivering supplies. Stanley didn’t have his license when he joined so he had to learn to drive for the first time on a two-and-a-half-ton truck. His unit stayed on the East Coast during 1942, preparing to defend the coast against invasion. In 1943, Stanley was sent to the Pacific Theater. His unit followed the Marines around and were responsible for securing the islands and making sure there were no Japanese left after the Marines had moved on. First, they did this on Makin Atoll in the Gilbert Islands and then Kwajalein Atoll in the Marshall Islands. Stanley was a Master Sergeant by this time and he was responsible for all transportation and servicing of vehicles and helped ensure that the men on the front lines got all the supplies they needed. In October of 1944, Stanley and his unit were sent to Hawaii for rest and relaxation. While there his unit was responsible for setting up a training school to help prepare other soldiers for combat. In January of 1945, the 111th was to secure their last island, Peleliu. There were more Japanese than usual still on the island and the unit sustained heavy casualties during this period. Stanley remained on Peleliu for the rest of the war and was discharged and sent home in November of 1945. When he arrived home he quickly got married and got a job selling insurance door-to-door. He bought a house with the help of his GI bill and later went into the retail business. He also joined the Jewish War Veterans of the USA. More of his story can be found at http://memory.loc.gov/diglib/vhp/story/loc.natlib.afc2001001.25502/. Thank you for your service, Stanley!